Singapore is currently Vietnam’s second largest trade partner in the Association of Southeast Asian Nations (ASEAN) region, after Thailand, and the sixth largest trade partner in the world, after China, Japan, the US, the Republic of Korea and Chinese Taipei. Vietnam has also become Singapore’s 11th biggest trade partner. 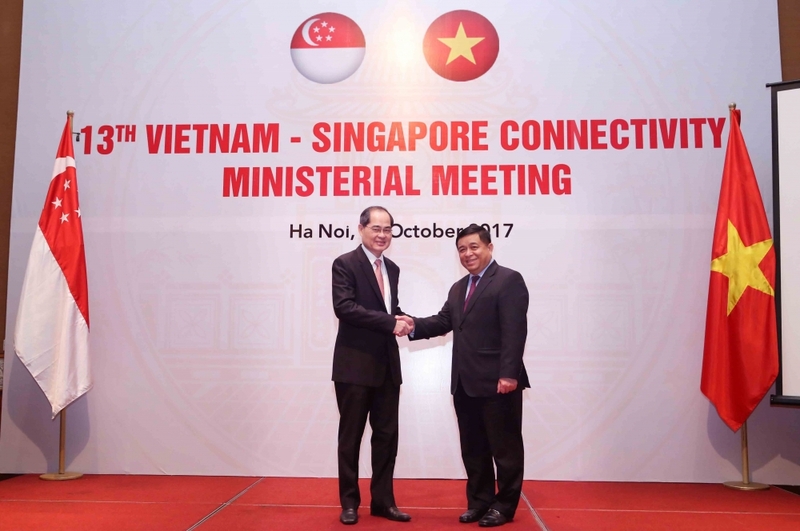 At the 13th Ministerial Meeting on Vietnam-Singapore Economic Connectivity held recently in Hanoi, Singaporean Minister for Trade and Industry Lim Hng Kiang noted that since the two countries established diplomatic relations in 1973, two-way trade has grown an impressive 12 percent annually for years. However, despite the strong growth of two-way trade, economists point to it imbalance given Vietnam’s sizable import surplus with Singapore. The surplus is attributed largely to Singapore’s stringent requirements in terms of quality of imported goods, food hygiene and safety and veterinary quarantine, which affect Vietnam’s strong export advantage in farm products like rice, fruit and dry seeds. So far, the two parties have not reached agreement on cooperation in agriculture or on mutual recognition of food hygiene and safety certification. Vietnamese businesses’ disadvantages in terms of management and marketing also hamper its ability to compete and succeed in the strong Singaporean market. At the recent discussions between the two sides, Vietnamese Minister of Planning and Investment Nguyen Chi Dung proposed that the two sides seek ways to facilitate Vietnamese exports to Singapore, particularly farm and forest products, seafood, processed food, textiles and garments, leather and footwear, wood furniture and construction materials. To boost economic connectivity and investment cooperation, the two sides proposed both countries’ state management agencies bolster cooperation, information exchange and experience sharing on management policies and knowledge in various fields such as communications, education-training, tourism-services, urban transportation planning and management, road transport development and export-import. The two sides will also increase annual forums on trade and investment promotion and make the most of bilateral and regional agreements to create better opportunities for Vietnamese goods to enter the market in Singapore. Vietnamese and Singaporean authorities have decided to enhance cooperation in quarantine and evaluation so that Vietnam’s standards conform to those of Singapore and reduce risks for Vietnamese farm exports to Singapore.